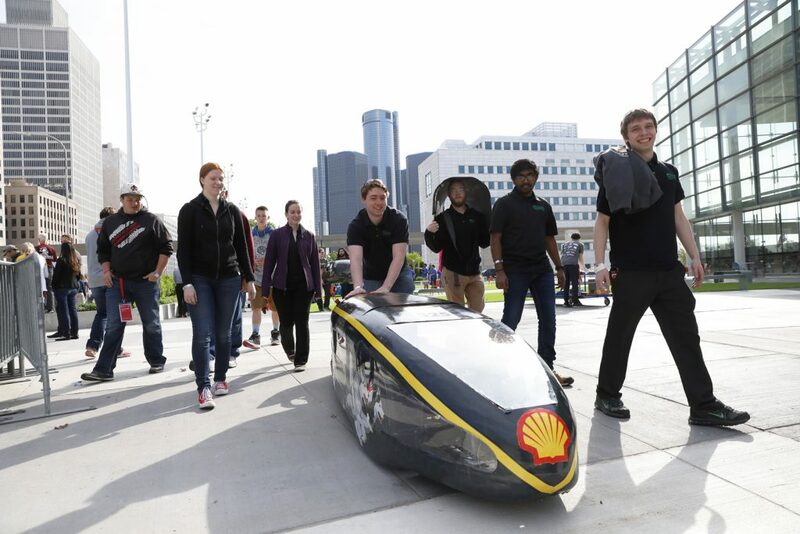 The 33rd annual Shell Eco-marathon Americas competition took place over the weekend, April 27-30 in Detroit, MI. This year’s event was the second season that Michigan Tech’s Supermileage Systems Enterprise team competed. 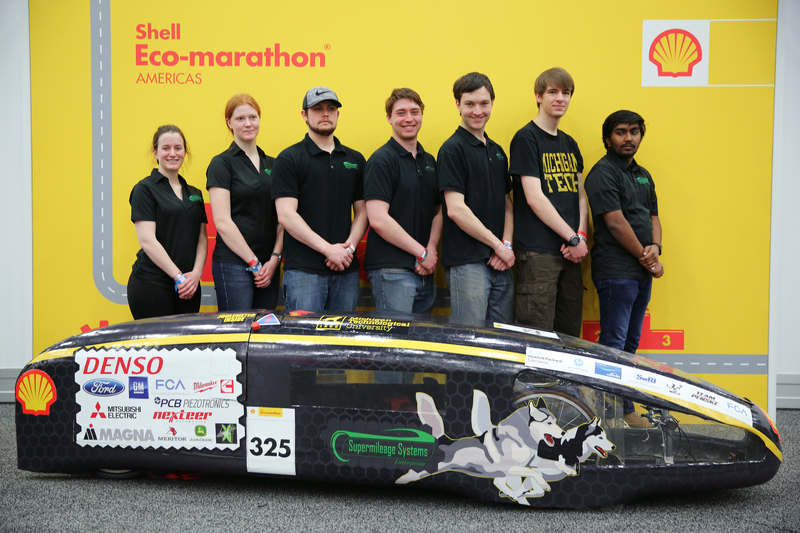 Shell Eco-marathon challenges student teams from around the world to design, build, test and drive ultra-energy-efficient vehicles. More than 100 teams from universities and high schools across the country and abroad came to the heart of the Motor City to compete on the track located on the city streets surrounding the Cobo Convention Center. In order to participate, teams must successfully complete a 4-phase registration process, including submission of technical information about their vehicle and design. There are two vehicle categories: urban concept and prototype. Within these categories there are three energy types: internal combustion (multiple fuel types), battery, and hydrogen. In order to compete, teams must pass a rigorous technical inspection and complete 10 consecutive laps around a 0.6 mile closed course in downtown Detroit, maintaining a minimum average speed of 15 mph. 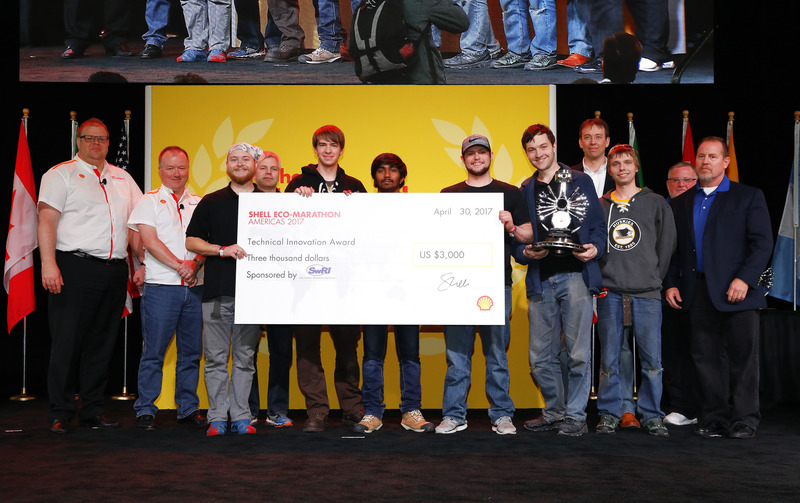 Awards are given for teams achieving the highest efficiency (either mpg or m/kWh). 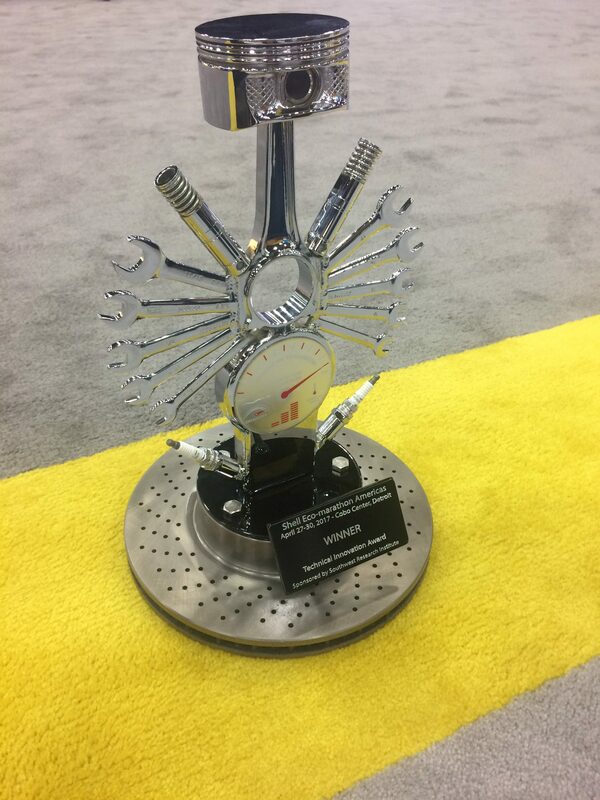 Off-track awards are also given for Innovation, Communication, Safety, Design, and Perseverance & Team Spirit. This year, 119 teams from 8 different countries were approved to compete. The Supermileage Enterprise competed in the Prototype/Battery Electric class. Of the 27 teams that participated, 22 made it through technical inspection and 17 completed at least one performance run. Tech’s Supermileage Systems Enterprise was one of those 17 teams. The team’s design included a 500W brushed DC motor and controller using a 48V/20Ah lithium ion battery back and battery management system. The motor controller must be purpose-built and designed by the team (i.e. no off the shelf controllers allowed). The Supermileage Enterprise improved their controller design from last year and upgraded the battery for improved vehicle acceleration. They completed one run with 104 m/kWh…about 3,500 MPGe. The team took 10th place in the BEV prototype category. Michigan Tech’s Supermileage Systems Enterprise team also competed for the Communications, Safety, and Technical Innovation Awards at the Shell Eco-marathon. 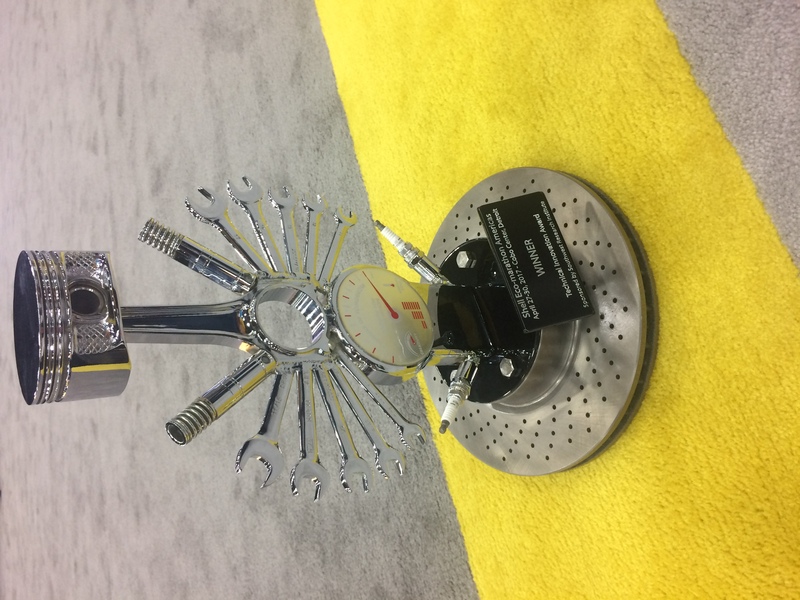 They won the Technical Innovation Award for their flexible motor controller design. The judges reviewed the application and interviewed the team. 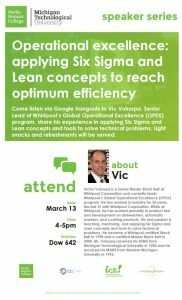 They noted the team’s well-defined engineering requirements as one of the key strengths over other applications. The $3,000 monetary award will be put to good use, and the Supermileage Systems Enterprise now has an impressive trophy to display on campus. The Supermileage Systems Enterprise team will now begin converting their vehicle over to the internal combustion engine for the upcoming SAE Supermileage competition on June 8-9 at the Eaton Proving Grounds in Marshall, MI. Good luck and congratulations! The Enterprise Program is now accepting Spring applications for the Carnahan Enterprise Scholarship. Please review the scholarship description and application form before applying. Enterprise ‘Above and Beyond’ Scholarship – New for Spring 2017! Please see below for the description, eligibility, and deadlines regarding our new and improved Enterprise ‘Above and Beyond’ Scholarship (formerly the ‘Super Senior Scholarship’). The Enterprise Program is still accepting Fall applications for the Carnahan Enterprise Scholarship. This scholarship is open to Business and Humanities majors who enroll in the Enterprise Program. Please review the scholarship description and application form for details. Rekhi Innovation Challenge is now Live! 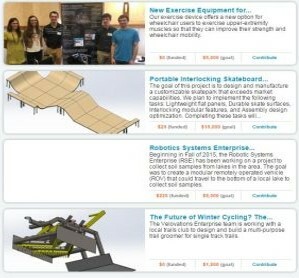 3 Enterprise Teams have posted 4 projects and seek to raise over $20,000 in just 60 days! The team who raises the most funding will receive a 100% match up to $10,000, with $400 in additional awards available. Check out the Rekhi Innovation Challenge on Superior Ideas! 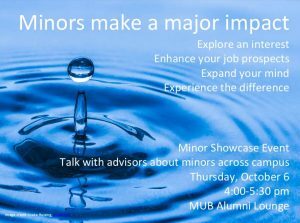 Enterprise students — please consider attending this event to learn more about the many minors available at Michigan Tech, including our 18-credit Enterprise Minor. 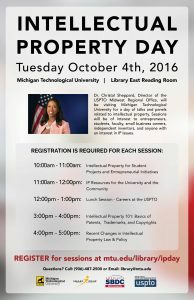 Attention Enterprise Teams – please see below for details on Intellectual Property Day. 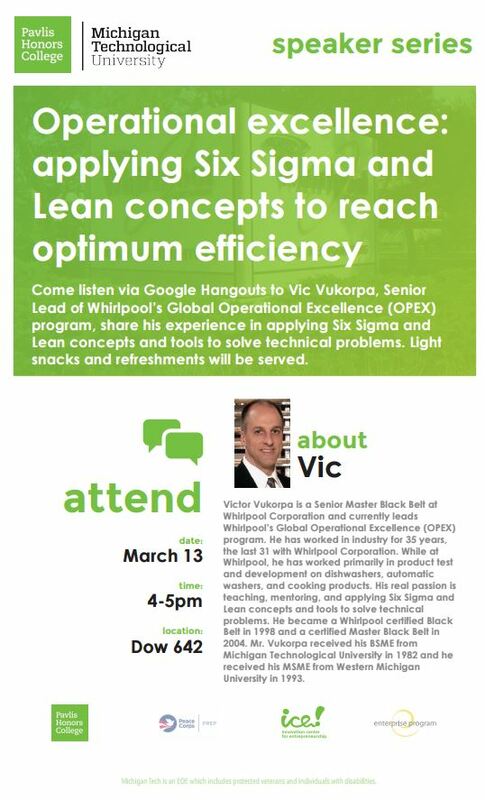 The sessions can be very helpful and relevant to your Enterprise projects and activities. The Vice President for Research Office and Pavlis Honors College are now accepting projects for the Rekhi Innovation Challenge, a crowdfunding competition whose aim is to promote student innovation and entrepreneurship through the use of Superior Ideas. The Challenge is open to Enterprise teams* whose projects include an innovative approach to an important design challenge or market need. Various awards will be given, and the team raising the most money through Superior Ideas will receive a 100% match up to $10,000! *Note: Industry sponsored projects and Advanced Motorsports (AMS) teams are not eligible to participate. A separate AMS crowdfunding challenge is being planned for Spring 2017. 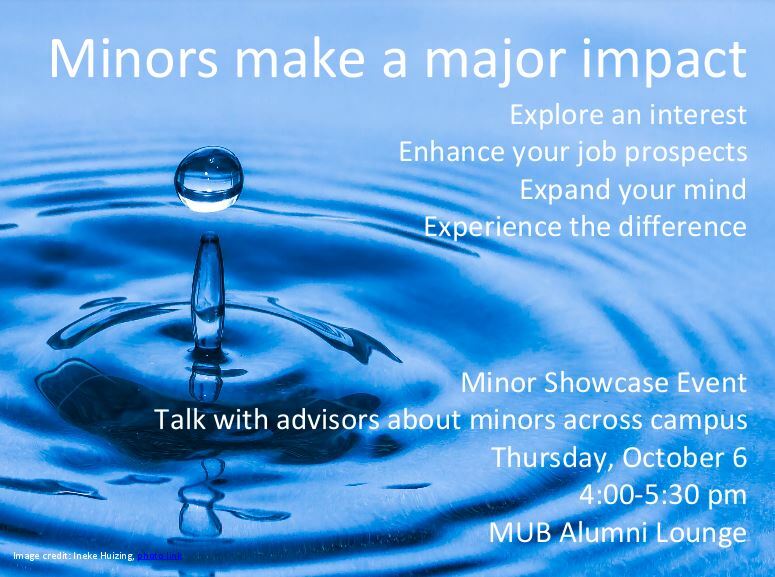 A kickoff workshop will be held on Thursday September 22 from 2:30-3:30 in the Pavlis Honors College/722 M&M. Interested teams are encouraged to send a representative to this session for Q&A and to review overall expectations of the Rekhi Innovation Challenge. To participate, please read the following information for teams, advisors, and the application form. 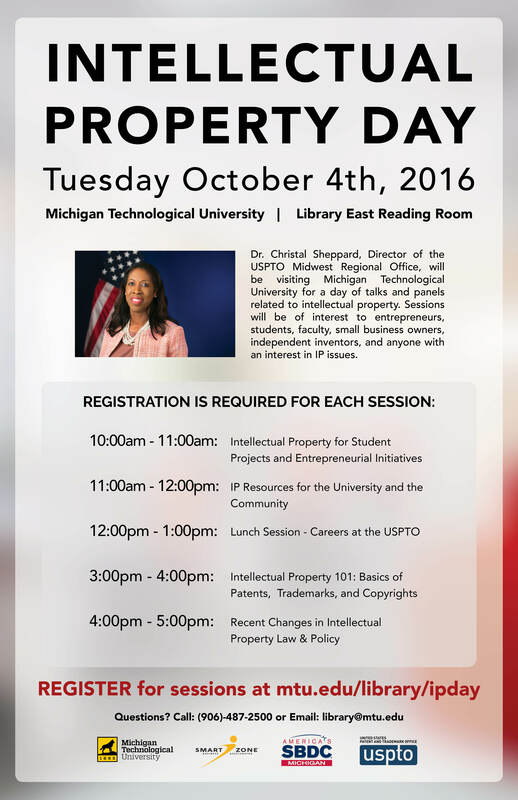 Any questions can be directed to Natasha Chopp at nichopp@mtu.edu. The Enterprise Program is now accepting Fall applications for the Carnahan Enterprise Scholarship. Please review the scholarship description and application form.